Did you know that Hood Memorial has had a pipe organ since 1923? Did you know that our organ was built by one of the finest American organ builders? Did you know that Skinner organs are known for their tone and quality sounds? Did you know that the Ladies Society of the Christian Church of Dunn, NC are the ones that spear-headed the efforts to get an organ in their new sanctuary and were responsible for seeing that the organ was paid for? Did you know that it took twenty years to pay off the organ (when a final settlement was reached in 1943)? Did you know that the original cost of the organ was around $7500 in 1923? And the 1999 appraisal for replacement of the organ would be $200,000? As we celebrate the 130th year of ministry as the Christian Church (Disciples of Christ) in Dunn, NC, we also recognize the incredible gift of music and the treasure of history that we have in our pipe organ. We have had some amazing musicians play the pipe organ and lead us to experience God’s greatness in magnificent ways. We are honored to praise God through the sound of the pipes each Sunday. Praise be to our Lord for the many hands that have played the keys, the many hands that raised money to pay for the instrument and its maintenance, and for all of the creative minds that have joined together through the years to ensure we are able to praise our God together in such a special way. Join us this Sunday for our Organ Concert at 5:00 PM in the Sanctuary. 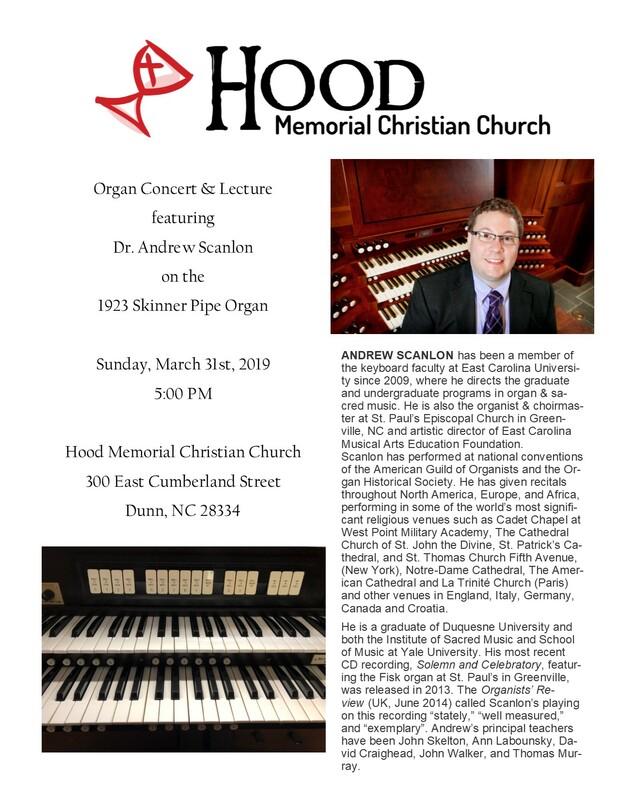 We are honored to welcome Dr. Andrew Scanlon, a talented organist and professor of keyboards at East Carolina University. His gift of music will truly touch our community and honor our God. Tell a friend about the treasure of history in our community and invite them to join us.